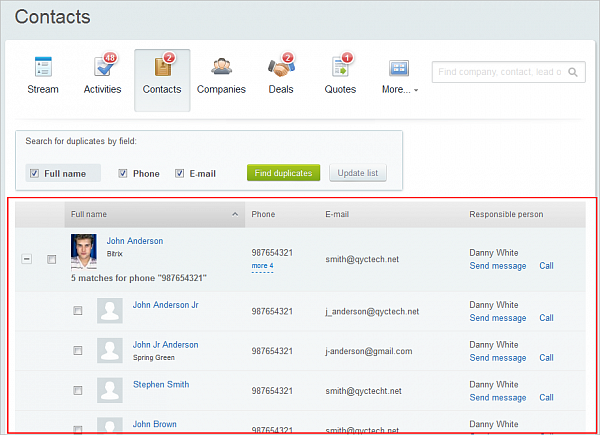 In March 2014 we added duplicate control to Bitrix24 CRM, alerting users that lead, contact or company they are trying to add to their database may already exist. This summer we expanded this feature to include searching and merging duplicate entries that can be performed at any time, not just data entry. 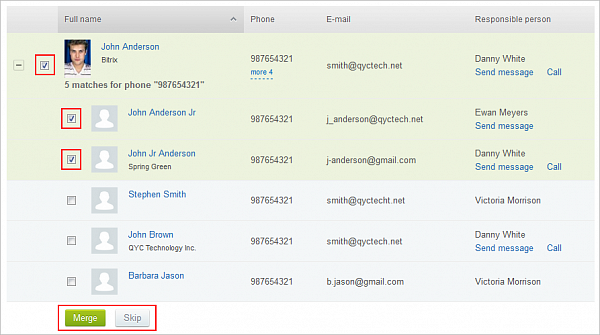 Duplicate search is available for three CRM entities – leads, contacts and companies. You start by selecting a CRM entity that you want to search for duplicates and cre ate index for it. After the index has been created, all you have to do is click the gear icon in the upper right corner and select Duplicate control, which is the last item in the drop down list. 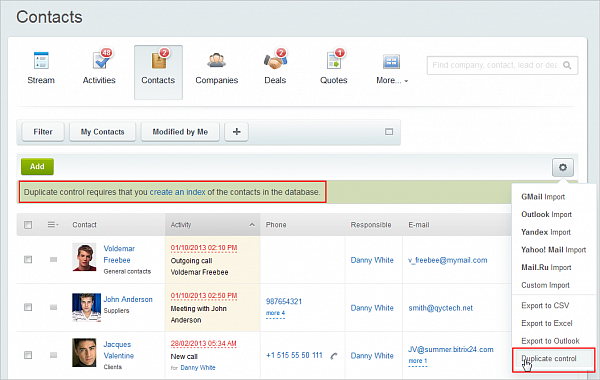 Bitrix24 CRM comes with flexible access rights. This usually means that multiple managers work with CRM, each having access only to his or hear leads, contacts or clients. Each manager is able to perform duplicate search, however if a duplicate entry is found among CRM entities assigned to another manager that the first manager has no access rights to, entity merging will not be available, meaning each manager can only merge entities that he or she is responsible for. 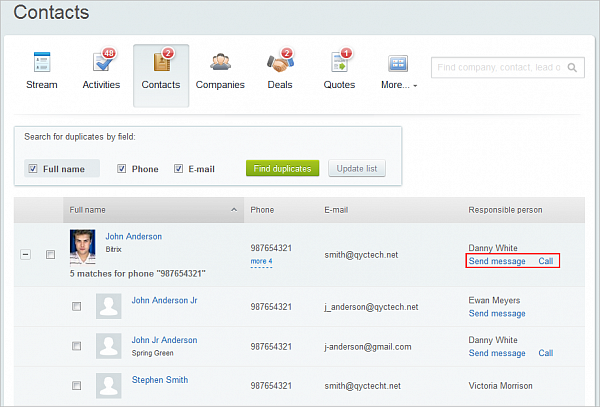 CRM administrator, however, will be able to merge duplicates regardless of the fact that such entities have been assigned to different mangers. So, now you are ready to merge duplicate entries. IMPORTANT! You can not reverse or undo duplicate entry merger right now, so this operation should be performed only by a person who understands the process and what information and access rights will be lost/altered as the result of the merger. We do plan to add merger history later on, which will provide a detailed log of changes and an option restore CRM entity elements, if necessary. Connections to deals, tasks, quotes and invoices will be changed too. If these were associated with a secondary entity that was deleted, they will no be connected to the primary entity. However, events from the activity stream of the secondary entity, such as creating a deal or an invoice, will not be added to the primary entity. Within a few months we plan to add duplicate and merger history page, which will not only show you which entities have been merged, but also undo mergers with entities that have been done mistakenly. We do understand that finding and merging duplicates is an important feature of any CRM, but it’s also a complicated process. If you have any suggestions or feedback about it, make sure you leave them in our Community Forum.